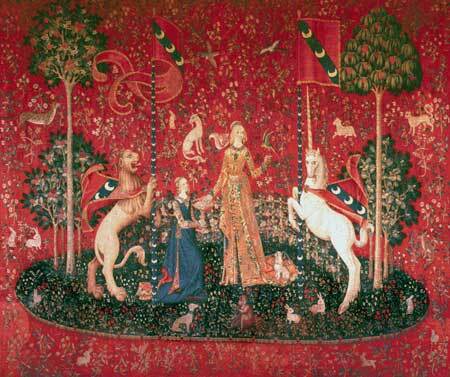 One of the series of Lady and Unicorn tapestries from Cluny representing the senses. The sense of taste is indicated by the lady taking a piece of candy from a large dish offered by her kneeling maid. The lady, dressed in an elaborate brocade gown, has a falcon perched on her finger. On each side, a prancing unicorn and lion carry banners and are also wearing capes with the same heraldic design. The millefleur background includes many kinds of flowers, and various birds and animals animals including rabbits, dogs, wildcats, sheep, monkeys, and goats. The trees are an oak, holly, orange, and possibly an imaginary species. (This pattern is solidly stitched.